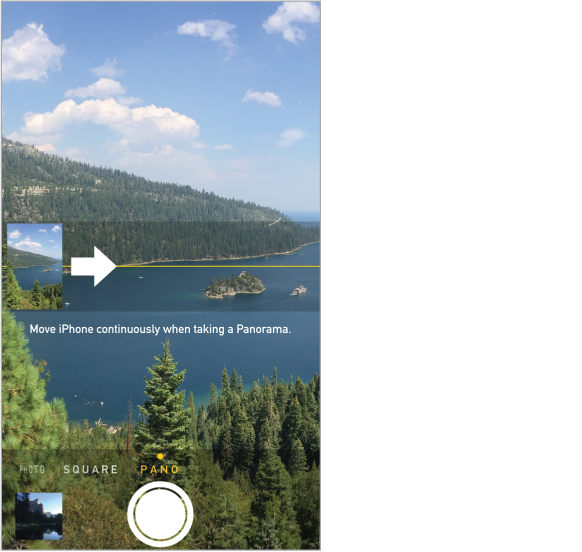 Camera offers several photo and video modes, which let you shoot stills, square-format photos, panoramas (iPhone 4s or later), videos, and slow-motion videos (iPhone 5s). Choose a mode. Drag the screen left or right to choose Slo-Mo, Video, Photo, Square, or Pano. Take a photo. Choose Photo, then tap the shutter button or press either volume button. Make it square: Choose Square. Take rapid-fire shots: (iPhone 5s) Touch and hold the shutter button to take photos in burst mode. The counter shows how many shots you’ve taken, until you lift your finger. To see the suggested shots and select the photos you want to keep, tap the thumbnail, then tap “Favorites.” The gray dot(s) mark the suggested photos. To copy a photo from the burst as a separate photo in Camera Roll, tap the circle on the lower-right corner. To delete the burst of photos, tap it, then tap . Apply a filter: (iPhone 4s or later) Tap to apply different color effects, such as black & white. To turn off a filter, tap , then tap None. You can also apply a filter later, when you edit the photo. See Edit photos and trim videos. A rectangle briefly appears where the exposure is set. When you photograph people, face detection (iPhone 4s or later) balances the exposure across up to 10 faces. A rectangle appears for each face detected. Exposure is automatic, but you can set the exposure manually for the next shot by tapping an object or area on the screen. With an iSight camera, tapping the screen sets the focus as well as the exposure. Face detection is temporarily turned off. To lock the exposure and focus until you tap the screen again, touch and hold until the rectangle pulses. Take a panorama photo. (iSight camera on iPhone 4s or later) Choose Pano, tap the shutter button, then pan slowly in the direction of the arrow. To pan in the other direction, first tap the arrow. To pan vertically, first rotate iPhone to landscape orientation. You can reverse the direction of a vertical pan, too. Shoot some video. Choose Video, then tap the Shutter button to start and stop recording. Snap a still while recording: (iPhone 5 or later) Tap the shutter button in the lower-left corner. Take it slow: (iPhone 5s) Choose Slo-Mo to shoot video at a high frame rate. You can set which section to play back in slow motion when you edit the video. Set the slow-motion section of a video. Tap the thumbnail, then use the vertical bars beneath the frame viewer to set the section you want to play back in slow motion. Zoom in or out. (iSight camera) Stretch or pinch the image on the screen. For iPhone 5 or later, zoom works in video mode as well as photo mode. If Location Services is turned on, photos and videos are tagged with location data that can be used by apps and photo-sharing websites. See Privacy. Want to capture what’s displayed on your screen? Simultaneously press and release the Sleep/Wake and Home buttons. The screenshot is added to your Camera Roll. You can edit photos and trim videos, right on iPhone. See Edit photos and trim videos.